Ladybugs | MWAH! S&P Shakers Figurines | One Price Low Flat Shipping! From Westland Giftware's Mwah! Salt and Pepper Shakers Collection, Ladybugs. Made of ceramic with glossy finish. Measures 2" tall. Hand wash only. 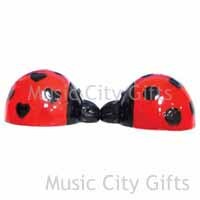 This 2 piece salt and pepper shakers set features two red and black ladybugs kissing. One is decorated with black heart shaped spots and the other with traditional round black spots. A strong small magnet holds these sweethearts together in big happy Mwah...SMOOCH!